I was investigating a bug recently that appeared to be a race condition causing RabbitMQ server to occasionally fail to cluster when the charm was upgraded. To attempt to reproduce the bug I decided to use Python library zaza. The last step is to tell Zaza what to do in a test run and this is done in the tests/tests.yaml. Zaza will generate a new model for each run and does not bring the new model into focus so it is safe to kick of the test run as many times as you like in parallel. Who needs pets? It's all about the cattle in the cloud world, right? Unfortunately, reality has a habit of stepping on even the best laid plans. There is often one old legacy app (or more) which proves somewhat reticent to being turned into a self-healing, auto-load balancing cloud entity. In this case it does seems reasonable that if the app becomes unavailable the infrastructure should make some attempt to bring it back again. In the OpenStack world this is where projects like Masakari come in. Masakari, when used in conjunction with masakari-monitors and Pacemaker, provides a service which detects the failure of a guest, or an entire compute node, and attempts to bring it back on line. The Masakari service provides an api and executor which reacts to notifications of a failure. Masakari-monitors, as the name suggests, detects failures and tells masakari about them. One mechanism it uses to detect failure is to monitor pacemaker, and when pacemaker reports a fellow compute node is down, masakari-monitors reports that to the Masakari service. Masakari also provides two other recovery mechanisms. It provides a mechanism for detecting the failure of an individual guest and restarting that guest in situ. Finally, it also provides a mechanism for restarting an operating system process if it stops; this mechanism is not covered here and the charm is configured to disable it. As mentioned above, Masakari monitors detect a compute node failure by querying the locally running cluster software. A hacluster charm already exists which will deploy corosync and pacemaker, and initial tests showed that this worked in a small environment. Unfortunately, the corosync/pacemaker is not designed to scale much past 16 nodes (see pacemaker documentation ) and a limit of 16 compute nodes is not acceptable in most clouds. This is where pacemaker remote comes in. A pacemaker remote node can run resources but does not run the full cluster stack in this case corosync is not installed on remote nodes and so the pacemaker remote nodes do not participate in the constant chatter needed to keep the cluster XML definitions up to date and consistent across the nodes. A new Pacemaker Remote charm was developed which relates to an existing cluster and can run resources from that cluster. In this example the pacemaker remotes do not actually run any resources, they are just used as a mechanism of querying the state of all the nodes in the cluster. Unfortunately due to Bug #1728527 masakari-monitors fails to query pacemaker-remote properly. A patch has been proposed upstream. The patch is currently applied to the masakari-monitors package in stein in the Ubuntu Cloud Archive. It might be expected that the masakari-monitors would have a direct relation to the masakari charm. In fact it does a lookup for the service in the catalogue so it only needs credentials which it obtains by having an identity-credentials relation with keystone. For a guest to be failed over to another compute host it must be using some form of shared storage. As a result, the scenario where a compute node has lost network access to its peers but continues to have access to shared storage must be considered. Masakari monitors on a peer compute node registers the compute node has gone and notifies the masakari api server. This in turn triggers the masakari engine to instigate a failover of that guest via nova. Assuming that nova concurs that the compute node has gone, it will attempt to bring it up on another node. At this point there are two guests both trying to write to the same shared storage which will likely lead to data corruption. The solution is to enable stonith in pacemaker. When the cluster detects a node has disappeared, it runs a stonith plugin to power the compute node off. To enable stonith the hacluster charm now ships with a maas plugin that the stonith resource can use. The maas details are provided by the existing hacluster maas_url and maas_credentials config options. This allows the stonith resource to power off a node via the maas api which has the added advantage of abstracting the charm away from the individual power management system being used in this particular deployment. The output above shows that the three pacemaker-remote nodes (frank-colt, model-crow & tidy-goose) are online. It also shows each remote nodes corresponding ocf::pacemaker:remote resource and where that resource is running. Each rule permits the grp_masakari_vips to run on that node, the score of 0 in the rule shows that all nodes are equal, it is not preferred that the resource run on one node rather than another. The clones require one additional trick, they attempt to run everywhere regardless of the symmetric-cluster setting. To limit them to the api nodes location, rules are needed as before. So an additional setting called clone-max is applied to the clone resource limiting the number of places it should run. Finally the stonith configuration is also managed as a resource, as can be seen from the crm status at the start of the section where st-maas-5937691 is up and running. As can be seen above, there is one stonith resource for all three nodes and the resource contains all the information needed to interact with the maas api. 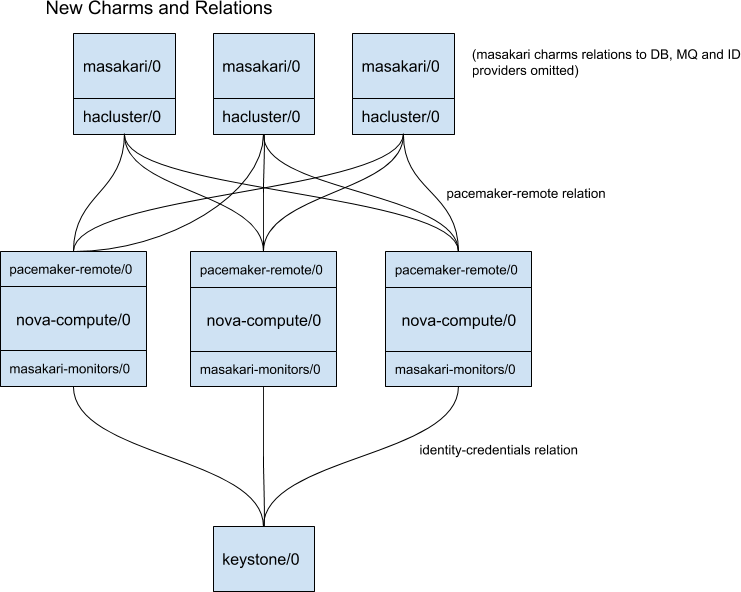 In Masakari the compute nodes are grouped into failover segments. In the event of a failure, guests are moved onto other nodes within the same segment. Which compute node is chosen to house the evacuated guests is determined by the recovery method of that segment. With auto recovery the guests are relocated to any of the available nodes in the same segment. The problem with this approach is that there is no guarantee that resources will be available to accommodate guests from a failed compute node. With reserved_host recovery compute hosts are allocated as reserved which allows an operator to guarantee there is sufficient capacity available for any guests in need of evacuation. Since the reserved host has now been enabled and is hosting evacuated guests, masakari has removed the reserved flag from it. Masakari has also placed the failed node in maintenance mode. These methods appear to chain the previous methods together. So, auto_priority attempts to move the guest using the auto method first and if that fails it tries the reserved_host method. rh_priority does the same thing but in the reverse order. See Pike Release Note for details. 2019-04-12 14:30:56.270 189712 INFO masakarimonitors.ha.masakari [-] Send a notification. 2019-04-12 14:31:03.262 39396 INFO masakari.engine.manager [req-f4e19958-7c04-4c29-bf02-de98064729b2 masakari - - - -] Notification 8c29844b-a79c-45ad-a7c7-2931fa263dab exits with status: finished. In the event of a compute node failing, pacemaker should spot this. The masakari host monitor periodically checks the node status as reported by pacemaker and in the event of a failure a notification is sent to the masakari api. Pacemaker should run the stonith resource to power off the node and masakari should move guests that were running on the compute node on to another available node. 2019-04-12 15:21:29.464 886030 INFO masakarimonitors.hostmonitor.host_handler.handle_host [-] Works on pacemaker-remote. 2019-04-12 15:21:29.643 886030 INFO masakarimonitors.hostmonitor.host_handler.handle_host [-] 'model-crow' is 'offline'. 2019-04-12 15:21:30.747 886030 INFO masakarimonitors.hostmonitor.host_handler.handle_host [-] 'tidy-goose' is 'online'. 2019-04-12 14:30:22.556 31553 INFO masakari.engine.manager [req-ec98fbd0-717b-41db-883b-3d46eea82a0e masakari - - - -] Notification cee025d2-9736-4238-91e2-378661373f9d exits with status: finished. 2019-04-12 15:21:31.252 31553 INFO masakari.engine.drivers.taskflow.host_failure [req-8abbebe8-a6fb-48f1-90fc-113ad68d1c38 masakari - - - -] Sleeping 30 sec before starting recovery thread until nova recognizes the node down. 2019-04-12 15:22:05.783 31553 INFO masakari.engine.manager [req-f7410918-02e7-4bff-afdd-81a1c24c6ee6 masakari - - - -] Notification 2f62f9dd-7edf-406c-aa16-0a4e8e3a3726 exits with status: finished.